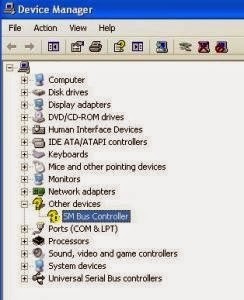 If you are having problem with SMBus (System Management Bus) driver which listed as not recognize in device manager, you can fix it by simply installing the right chipset drivers for your computer. Do I need this drivers? yes, it will increase your computer system stability and function. With System Management Bus, a device can provide manufacturer information, tell the system what its model/part number is, save its state for a suspend event, report different types of errors, accept control parameters, and return its status. You need to download and install the chipset driver because SMBus is part of the chipset component. To get the right chipset driver to fix your Sm Bus controller refer to the method below. You can download it from your computer manufacture support website. Just go to the download site and select your model from the list and download the chipset drivers base on your current Operating system (Windows 7 etc). There are 3 most common chipset used nowadays which are Intel, AMD and Nvidia. You can identify your chipset by looking at the SMBus Hardware ID. Search your hardware ID on Google and you will see the search result shows Intel, AMD or Nvidia Chipset. AMD Chipset : Install AMD automatic driver detection tools. Run windows automatic updates to see if there are any available drivers update for your computer. 2. You can use 3rd party software to identify missing and outdated drivers but I do not recommend to use this method because sometimes their update and drivers can mess up your system. If you have problem installing your SMBus driver, just post your hardware ID in the comment section below and I'll provide the driver you need to download and install. Thanks for reading SMBus Controller Drivers and Fixes . Please share...!